In the world of antique selling there is the term “small”. The Big Business of Smalls, published by the New York Times, is my favorite article defining smalls. My favorite line in the article says, smalls are “a category of antique usually greater in personality than size or price”. Often, I go hunting for new treasure with the resolve to only come away with large items like furniture. Almost every time, I walk away with my arms full of “personality” rather than furniture. These little items have a way of adding character or telling a story without having to hit the wallet. They offer the buyer the ability to have something special, that can fit almost anywhere. There is no need to move around furniture, or to measure to fit a small in a space. They aren’t expensive enough to be a commitment. They are just a little bundle of charming. So here are some of the smalls you can find in my little space Antikita Vintage Market located inside of Kelly and Company. Bottles are such an awesome little collection piece. 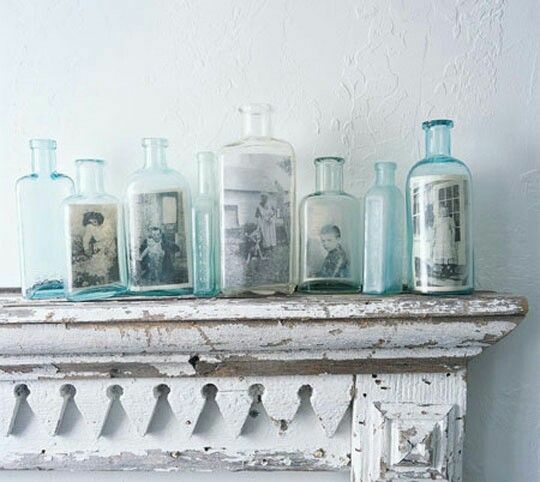 They are usable as vases and even frames. Here are a few in my space. The following image is from Pinterest and shows a great idea for using them. Let’s not forget, the awesome chippy yellow finial in the center. Such a fun pop of color for a side table, coffee table, book shelf etc. Enamelware! I love enamelware. There is something soft about it. The creamy white and the soft blue lines. It just screams put flowers in me and call me a vase. And when flowers aren’t in it, a collection of enamelware looks beautiful together. A picture from Pinterest. Oh and one more from On Sutton Place. This one isn’t “smaller than a bread box” so it may not be considered a small, technically. I still consider it a small because of price and the mere thought that it is a changeable decor piece. Honestly, if this really unique globe doesn’t sell, I see myself keeping it, and beginning a small collection to display, just like in the picture from Flickr. Jewelry. This piece of costume jewelry is just so pretty. I imagine this mirror sitting in some beautiful french bathroom or changing room. It is so delicate. These vintage wooden spools are a great small collectible. They are also on sale! Ok, I know “not smaller than a bread box” so not a small. But really, when I am hunting for a dresser and walk away with a suitcase, it feels rather small! I fell in love with this when I saw it. I thought of keeping it at first, thinking “I could be the girl that walks into fancy hotels with an awesome white vintage suitcase.” People will go “look there is the girl with the awesome white vintage suitcase”. And then I snapped out of it and heard my husband say “so you think your a minimalist, yet you have a new thing”. Anyway, it’s in the store. The second picture shows it’s lemony interior with white polka dots! It’s a pillar, not a small. I agree. It has no business being in this blog post. Except that is neat and very usable and a great white! Back to smalls. I love her! The Pepsi Cola ad shows a really cool chick in a fabulous black outfit. I have her displayed in the store with another cool chick. I found this photo at Scott’s Market. I don’t know who she was, but I love her confidence! And lastly a beautiful card box found in Charleston. Next Post Making Party Favors For a Bridal Shower: The Perfect Mix Margarita!